In October, Bulgarian archaeologists clearing a plot for highway construction came across a Neolithic home and a skeleton date back to 6000 BC. The Neolithic Age home was discovered close to the village of Krum in the Haskovo District by the team of archaeologist Boris Borisov, who are excavating a plot designated for the construction of the Maritsa Highway going to the Turkish border.The skeleton was said to belong to a young disabled person, aged between 10 and 15. In July, a 8000-year-old skeleton of a young man was found near the village of Ohoden.The skeleton, dubbed by the Bulgarian media as "the first European", belonged to an about 35-year-old man with a height of 165 cm. In July, archaeologists found what has been described as a wealthy 8000-year-old town close to the Danube city of Ruse. The town, which flourished between 5 800 BC and 5 500 BC had well-organized streets and even two-storey houses with oak floors. A prehistoric home dated back 7000 years was uncovered by a team of Bulgarian archaeologists at Telish in the central northern District of Pleven. The team led by archaeologist Ventsislav Gergov is convinced that the home found in a place known as "Laga" is part of a village with at least 30 robust houses. In December, Bulgarian archaeologist Georgi Ganetsovski made a new hit discovering by unearthing what might be the world's oldest sun temple. The team of Georgi Ganetsovski, an archaeologist from the Vratsa Regional History Museum, who specializes in paleolithic settlements, uncovered a structure similar in function to the Stonehenge in the UK but is 3 000 years older than it. In September, Bulgarian archaeologist Nikolay Ovcharov discovered two tombs of Ancient Thracian rulers near the famous rock city and sanctuary of Perperikon. The tombs are dated to 1100-1000 BC judging by the pottery and ceramics found in them, which are characteristic of the later Bronze Age and the early Iron Age. In November, Bulgarian archeologists and experts from the National History Museum discovered a sanctuary older than the ancient Thracian city of Perperikon. Like Perperikon, the Belintash sanctuary is located in the Rhodoppe Mountains, but at a higher altitude. Archaeologists are dating the sanctuary, dedicated to Thracian God Sabazius, from the 5th century b.c., making it the oldest one in Europe. In October, archaeologist Nikolay Ovcharov presented an intriguing discovery: an ancient cooking stove cut right into the stones of the rock city dated back to 3rd-4th century.The stove consists of a lower part, a hearth, whose ceiling has two holes that let through some fire; the ceramic cooking vessels would be placed on top of the holes. In August, Bulgarian archaeologists explored a Late Antiquity fortress located near the town of Byala on the St. Atanas Cape on Bulgaria's Black Sea coast that they found in 2010. The team of archaeologists uncovered a number of new details of the early Byzantine fortress, including what is believe to be the discovery an ancient winery. In September, a team of archaeologists from the Bulgarian National History Museum uncovered a highway dating back to the zenith of the Roman Empire. They unearthed a section of the Roman road connecting Ulpia Oescus, a Roman town on the Danube near today's Bulgarian village of Gigen, with Philipopolis (today's Plovdiv), crossing the Balkan (Stara Planina) range. In the 4th century the above-mentioned highway was crucial for the Roman Empire as it connected its Balkan lands with its territories north of the Danube. In December, Bulgarian archaeologists probably discovered Blismos, a major ancient and medieval town in the Roman, Byzantine, and First Bulgarian Empires. The town discovered by the archaeologists is located near the village of Zlatna Livada ("Golden Meadow") in the Chirpan Municipality and is located on the major road from Constantinople to Philippopolis, the Greek name of today's Plovdiv.The uncovered town existed for several centuries in the Late Antiquity and the Middle Ages. It has been described as being untypically big. A team of Bulgarian archaeologists discovered seven 13th-century gold coins in the northern city of Veliko Tarnovo. Archaeology professors Nikolay Ovcharov and Hitko Vachev found the treasure while excavating the St. Petar and St. Paul Church in the medieval Bulgarian capital, on the Tsaravets Hill, which hosted the Bulgarian royal palaces back in the 1200s-1300s. This is the largest golden treasure ever found in Veliko Tarnovo, which was the capital of the Second Bulgarian Empire (1185-1396). In August, a team of Bulgarian archaeologists discovered a 14-th century treasure of 166 silver coins during excavations at the medieval fortress of Kastritsi on the Black Sea coast. The archaeologists led by the Director of the Varna Regional History Museum Valentin Pletnyov found a jar hidden in the floor of one of the medieval homes in the fortress. In July, a three-mast sail ship, dating from the 18th-19th century, was found by divers 26 meters east from the Bulgarian southern Black Sea town of Sozopol. The find has been located 90 meters below the sea level, the Bulgarian Underwater Archeology Center informed. This is the largest sunken vessel to be located in Bulgarian waters, according to the Center. In March, the construction of the second metro line in the Bulgarian capital Sofia was stopped over the discovery of a unique archeology site. The builders came across a medieval church located in the very downtown of Sofia, next to the Tzum retail center. This led to a temporary termination of the construction work. Later in March, an archaeological complex on several levels was announced to be set up in the very downtown of the Bulgarian capital Sofia. The complex is going to feature archaeological discoveries revealed during the construction of the second metro line in Sofia. In April, Bulgaria's capital Sofia was said to need about BGN 20 M in order to excavate and restore the archaeology complex of ancient and medieval Serdika. The Sofia Municipality and the Culture Ministry decided to turn the very downtown of the Bulgarian capital into a top tourist attraction by revealing the streets of the the Roman town of Serdika and the medieval town of Sredets. The future Metro Station 8-II in Sofia happens to be located right in the center of the ancient Thracian and Roman town of Serdika where Emperor Constantine the Great had a summer palace, and of the medieval Bulgarian town of Sredets. In June, a large ancient building located under the St. Nedelya Cathedral in downtown Sofia was said by archaeologists to possibly be a palace of Roman Emperor Constantine the Great. Remains believed to be John the Baptist's, including a skull fragment and a tooth, were uncovered at the end of July during the excavation of a fourth-century monastery on St. Ivan Island, off Bulgaria's Black Sea coast. They were in a sealed reliquary buried next to a tiny urn inscribed with St. John's name and his birth date. When Bulgarian archaeologists declared they had found relics of John the Baptist, one of the most significant early Christian saints, their discovery became the subject of huge interest, much skepticism and even scam allegations. 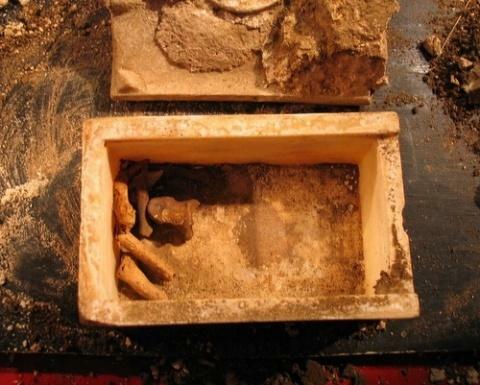 According to excavation leader Professor Kazimir Popkonstantinov the Greek inscription on the tiny sandstone box, reading "God, save your servant Thomas. To St John. June 24", the date, celebrated by Christians as John the Baptist's nativity, is a very strong proof that the relics of John the Baptist are genuine, the key clue to their origin. But the discovery on Sveti Ivan and the claims about the box-office draw of Sozopol as a center of religious tourism have been greeted with strong skepticism by some within Bulgaria's archaeological community. Much of the criticism has been directed at Diaspora Minister Bozhidar Dimitrov, whose confident claims about the relics and their potential for the county's economic recovery provoked criticism from leading archaeologists. In response, Dimitrov made a vulgar expletive at the critics of what are believed to be relics of John the Baptist, prompting calls for his resignation. While Popkonstantinov concedes that his case for the relics mixed fact with hypothesis, he enjoys the support of those experts, who say spirituality always rubs up against archaeology. Bulgarian government plans to benefit from the box-office potential of the discovery, going as far as to say that Sozopol will be the new Jerusalem. In October, real war erupted between the Mayor of Bulgaria's Plovdiv Slavcho Atanasov and the central government for the rights on the country's most impressive archaeological gold treasure from Ancient Thrace. He said the Panagyurishte Gold Treasure is formally part of the inventory of the Plovdiv Museum, and that the Plovdiv Museum's claims on it are further boosted by the fact that it has been receiving allowances from the state revenues from the treasure's displays abroad. However, the treasure was successfully returned to Sofia. In August, customs officers in the Canadian city of Montreal seized 21 000 antique objects with Bulgarian origins, in a smuggling attempt. The antiques consist of coins, jewels, metal and glass objects from the Bulgarian, Greek, Roman, Byzantine and Ottoman heritage. In October, Bulgarian police have shattered a crime group trafficking archaeological finds, including breath-taking items such as 2-meter marble statue which was believed to be of Aphrodite. As it later turned out, the statue is a Roman tomb sculpture of an ordinary woman. In November, Bulgaria's police cracked down on the traffic of archaeology items in a special operation codenamed "Treasure Hunters".The operation was carried out in the Western town of Kyustendil and two nearby villages, with the police capturing 1 silver rhyton, a number of decorated ancient artifacts with images including statuettes, knives, bronze lamps, pottery vessels, rings, and 74 ancient coins from different time periods.